It is always considered that iron is only found in the blood, especially the erythrocytes. Though majority of Iron does circulate in the blood as a part of the haemoglobin protein, iron and haemoglobin are two separate entities. Iron is also found in other parts of the body. Let us look at the difference between the two. Haemoglobin is the protein that imparts the red colour to the red blood cells circulating in the blood. 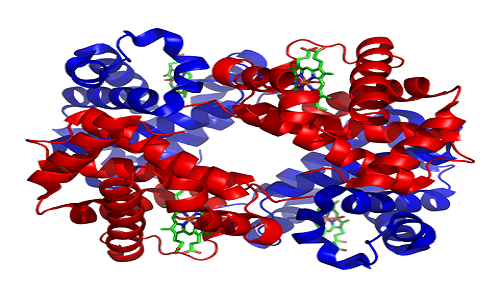 Combination of haem protein and iron molecule forms the haemoglobin protein molecule. The main function of haemoglobin is to carry oxygen from the lungs to the rest of the body tissues and to bring back carbon di oxide from the rest of the body back to the lungs so as to remove it through exhalation. Normal haemoglobin levels are around 12-14 gm% in women and 14-16 gm% in men. Haemoglobin levels lower than this indicates that the person is in a state of anaemia. The patient is advised to increase the haemoglobin levels by increasing the intake of iron and vitamin C through diet and supplements. Extremely severe cases of anaemia are treated through blood transfusion. Anaemia usually occurs after heavy blood loss. Gastrointestinal blood loss is a common cause of anaemia in men and post-menopausal women. Genitourinary loss is the main cause of anaemia in women of reproductive age group. Iron is an important macronutrient required by the human body. Around 70 percent of the iron is found in the blood as a part of the haemoglobin molecule. The total iron in the body is approximately 3.9g, of which 2.5g is a part of haemoglobin, 500mg is stored in the heart and 250 mg is stored in the liver. The bone marrow holds another 150mg of iron. Myoglobin or the enzymes present in the muscles contains 300mg of iron. The other enzymes present in the body make up the remaining 150 mg. The plasma also carries 5 mg of iron bounded to transferrin protein. This distribution of iron shows how important Iron is for various respiratory and metabolic activities. Apart from this it also plays a vital role in collagen synthesis and formation of neurotransmitters. Body immunity also depends on iron levels as it dictates the haemoglobin levels. The iron stored in the body is in the form of ferritin that circulates in the blood. There is difference in iron stores in men and women with men having around 1000 mg of stores iron and women having 300 mg. Minimum daily requirement of iron is around 1.8 mg out of which only 10-30 percent is actually absorbed. To maximize the absorption of iron it is advised to increase the intake of Vitamin C. If a diet deficient in iron is consumed over a prolonged period (or prolonged starvation) it may lead to depletion of the iron stores in the body causing iron deficiency anemia. To summarize Iron is an important constituent of our diet as it combines with many important molecules in the body and aids in cellular respiration and metabolism. Deficiency of iron can lower the Hemoglobin levels causing reduced oxygen transport to the body tissues. This puts the body in a state of fatigue and low energy levels. Maitreyi Naigaonkar. "Difference Between Haemoglobin and Iron." DifferenceBetween.net. July 6, 2015 < http://www.differencebetween.net/science/health/difference-between-haemoglobin-and-iron/ >.